No one well serves any specific property. The water distributed throughout the system may include water from every source as the entire distribution system is interconnected. Interconnections with adjacent water suppliers also supply the system. Various factors affect the movement of water, including user demand, the level of water in the tanks and wells being temporarily taken out of service for maintenance or repair. On average, wells supplying the water system are in a pumping state for a total of approximately 14 hours each day. The active or inactive state of the wells depends on the amount of water in the storage tanks. When the water levels in the tanks drop to a predetermined level, the wells begin to pump simultaneously to meet customer demand and refill the tanks. The flow schematic below depicts the wells in an active pumping state. While the wells are pumping, water is being supplied throughout the system both from the tanks and the various sources of water making their way to the tanks. 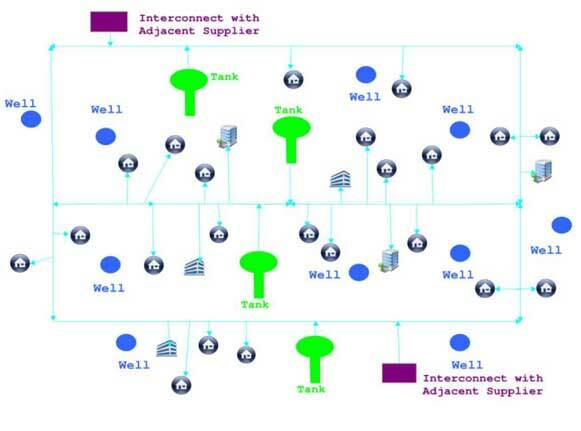 Movement of the water can be in multiple directions, can follow different paths to the tanks, and can change direction based on changes in system conditions, serving homes and businesses along the way. As a result, sources of supply are blended within the storage tanks and throughout the distribution system. When the tanks refill, the wells turn off and water is supplied from the storage tanks as depicted below. Water in the tanks is diminished and restored two to three times throughout each day and the wells cycle accordingly between active and inactive pumping states. Water leaving the tanks can flow in multiple directions, can follow different paths and can change direction based on changes in system conditions. As a result, water serving a specific property when the wells are inactive is blended with the water in the distribution system and can come from various tanks.